This article is about the religious motif. For other uses, see World Tree (disambiguation). It has been suggested that Tree of life be merged into this article. (Discuss) Proposed since April 2018. Russian 19th-century ornament of the world tree. The world tree is a motif present in several religions and mythologies, particularly Indo-European religions, Siberian religions, and Native American religions. The world tree is represented as a colossal tree which supports the heavens, thereby connecting the heavens, the terrestrial world, and, through its roots, the underworld. It may also be strongly connected to the motif of the tree of life, but it is the source of wisdom of the ages. Specific world trees include égig érő fa in Hungarian mythology, Ağaç Ana in Turkic mythology, Modun in Mongol mythology, Yggdrasil (or Irminsul) in Norse (including Germanic) mythology, the oak in Slavic, Finnish and Baltic, Iroko in Yoruba religion, Jianmu in Chinese mythology, and in Hindu mythology the Ashvattha (a Ficus religiosa). Among pre-Columbian Mesoamerican cultures, the concept of "world trees" is a prevalent motif in Mesoamerican cosmologies and iconography. The Temple of the Cross Complex at Palenque contains one of the most studied examples of the world tree in architectural motifs of all Mayan ruins. World trees embodied the four cardinal directions, which represented also the fourfold nature of a central world tree, a symbolic axis mundi connecting the planes of the Underworld and the sky with that of the terrestrial world. Depictions of world trees, both in their directional and central aspects, are found in the art and traditions of cultures such as the Maya, Aztec, Izapan, Mixtec, Olmec, and others, dating to at least the Mid/Late Formative periods of Mesoamerican chronology. Among the Maya, the central world tree was conceived as, or represented by, a ceiba tree, called yax imix che ('blue-green tree of abundance') by the Book of Chilam Balam of Chumayel. The trunk of the tree could also be represented by an upright caiman, whose skin evokes the tree's spiny trunk. Directional world trees are also associated with the four Yearbearers in Mesoamerican calendars, and the directional colors and deities. Mesoamerican codices which have this association outlined include the Dresden, Borgia and Fejérváry-Mayer codices. It is supposed that Mesoamerican sites and ceremonial centers frequently had actual trees planted at each of the four cardinal directions, representing the quadripartite concept. World trees are frequently depicted with birds in their branches, and their roots extending into earth or water (sometimes atop a "water-monster", symbolic of the underworld). The central world tree has also been interpreted as a representation of the band of the Milky Way. Izapa Stela 5 contains a possible representation of a world tree. A common theme in most indigenous cultures of the Americas is a concept of directionality (the horizontal and vertical planes), with the vertical dimension often being represented by a world tree. Some scholars have argued that the religious importance of the horizontal and vertical dimensions in many animist cultures may derive from the human body and the position it occupies in the world as it perceives the surrounding living world. Many Indigenous cultures of the Americas have similar cosmologies regarding the directionality and the world tree, however the type of tree representing the world tree depends on the surrounding environment. For many Indigenous American peoples located in more temperate regions for example, it is the spruce rather than the ceiba that is the world tree; however the idea of cosmic directions combined with a concept of a tree uniting the directional planes is similar. The world tree is widespread in Lithuanian folk painting, and is frequently found carved into household furniture such as cupboards, towel holders, and laundry beaters. The world tree (Latvian: Austras koks - "Tree of Dawn") also was one of the most important beliefs in Latvian mythology. In the Iranian mythology, Gaokerena or white Haoma, is a tree that its vivacity would certify continuance of life in universe. Bas tokhmak is another world tree with remedial attribute, it's retentive of all herbal seeds, and destroyer of sorrow. World tree is a common motif in ancient art of Iran. 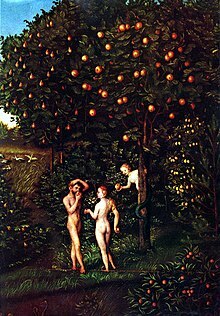 The Tree of the knowledge of good and evil and the Tree of life are both components of the Garden of Eden story in the Book of Genesis in the Hebrew Bible. According to Jewish mythology, in the Garden of Eden there is a tree of life or the "tree of souls" that blossoms and produces new souls, which fall into the Guf, the Treasury of Souls. The Angel Gabriel reaches into the treasury and takes out the first soul that comes into his hand. Then Lailah, the Angel of Conception, watches over the embryo until it is born. In Norse mythology, Yggdrasil is the world tree. Yggdrasil is attested in the Poetic Edda, compiled in the 13th century from earlier traditional sources, and the Prose Edda, written in the 13th century by Snorri Sturluson. In both sources, Yggdrasil is an immense ash tree that is central and considered very holy. The Æsir go to Yggdrasil daily to hold their courts. 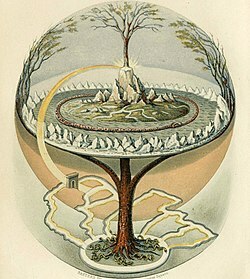 The branches of Yggdrasil extend far into the heavens, and the tree is supported by three roots that extend far away into other locations; one to the well Urðarbrunnr in the heavens, one to the spring Hvergelmir, and another to the well Mímisbrunnr. Creatures live within Yggdrasil, including the harts Dáinn, Dvalinn, Duneyrr and Duraþrór, the giant in eagle-shape Hræsvelgr, the squirrel Ratatoskr and the wyrm Níðhöggr. Scholarly theories have been proposed about the etymology of the name Yggdrasil, the potential relation to the trees Mímameiðr and Læraðr, and the sacred tree at Uppsala. The world tree is also represented in the mythologies and folklore of North Asia and Siberia. In the mythology of the Samoyeds, the world tree connects different realities (underworld, this world, upper world) together. In their mythology the world tree is also the symbol of Mother Earth who is said to give the Samoyed shaman his drum and also help him travel from one world to another. The symbol of the world tree is also common in Tengrism, an ancient religion of Mongols and Turkic peoples. The world tree is visible in the designs of the Crown of Silla, Silla being one of the Three Kingdoms of Korea. This link is used to establish a connection between Siberian peoples and those of Korea. Remnants are also evident in the Kalpavriksha ("wish-fulfilling tree") and the Ashvattha tree of the South Asian religions. In Brahma Kumaris religion, the World Tree is portrayed as the "Kalpa Vriksha Tree", or "Tree of Humanity", in which the founder Brahma Baba (Dada Lekhraj) and his Brahma Kumaris followers are shown as the roots of the humanity who enjoy 2,500 years of paradise as living deities before trunk of humanity splits and the founders of other religions incarnate. Each creates their own branch and brings with them their own followers, until they too decline and split. Twig like schisms, cults and sects appear at the end of the Iron Age. Some scholars suggest that the world tree is programmed into the human mind by evolutionary biology. Theory suggests that human beings are primates, and lived in trees for around 60 million years. The idea of a vast tree as the entirety of the world is thus still implanted in our collective unconscious. Wikimedia Commons has media related to World tree. It's a Big Big World, TV-series which takes place at a location called the "World Tree"
Tree of Life, The Tree of Life is an archetype that is universal, across all cultures"
^ Miller and Taube (1993), p.186. ^ Miller and Taube, loc. cit. ^ Straižys and Klimka, chapter 2. ^ Taheri, Sadreddin (2013). "Plant of life, in Ancient Iran, Mesopotamia & Egypt". Tehran: Honarhay-e Ziba Journal, Vol. 18, No. 2, p. 15. ^ Origins of the Kabbalah. Books.google.com. 1990. ISBN 0691020477. Retrieved 2014-05-01. ^ "200_ THE TREASURY OF SOULS for Tree of Souls: The Mythology of Judaism". Scribd. Archived from the original on 2012-10-30. Retrieved 15 June 2015. ^ Walliss, John (2002). From World-Rejection to Ambivalence. Ashgate Publishing. pp. 33. ISBN 978-0-7546-0951-3. Burkert W (1996). Creation of the Sacred: Tracks of Biology in Early Religions. Harvard University Press. ISBN 978-0-674-17570-9. Roys, Ralph L., The Book of Chilam Balam of Chumayel. Norman: University of Oklahoma Press 1967. This page was last edited on 27 March 2019, at 10:18 (UTC).